In the hall of the Central Military Club 60 years of Military Technical Courier, the scientific journal of the Ministry of Defence, were marked on 27th august 2012. 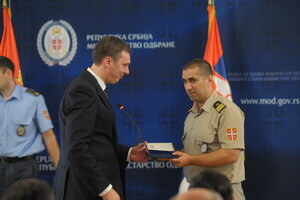 On this occasion, the first Deputy Prime Minister and Defense Minister Aleksandar Vucic handed the editor of the Military Technical Journal Lieutenant Colonel Nebojsa Gacesa a Military Memorial Medal for outstanding contribution to the defense of the Republic of Serbia. 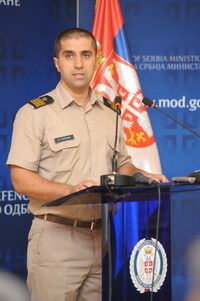 The ceremony was attended by SAF Chief of the General Staff Lt. Gen. Ljubisa Dikovic, Secretary of State Aleksandar Nikolic and Assistant Minister for Defence Miroslav Jovanovic and Assistant Minister for Budget and Finance Srbislav Cvejic. 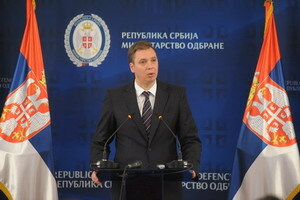 Congratulating this important date, Minister Vucic said that for this journal was able to learn something about the "cyber" warfare and chemical reconnaissance, thus comprehending the significance and importance of the journal. - The future of our Army comes from much of what we know and from what we can learn. 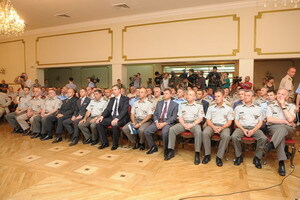 The Military Technical Bulletin is the best magazine and a textbook per se, from which we can learn, and improve- as Minister Vucic said, adding that according to the policy of national defense on militarily neutrality, we have to take care of our future ourselves, as well as about the improvement of our technology and techniques. The minister thanked the editorial team, magazine editors and contributors, while promising continued support for the work that is of great importance for the entire defense system, defense industry, but also for the country’s future. 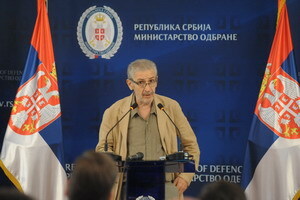 On this occasion, Colonel Nebojsa Gacesa spoke about the history and achievements of scientific journals and praised the efforts of previous authors, editors and editorial boards. 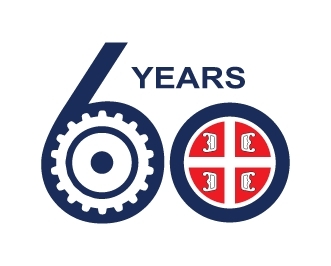 - On this special occasion we would like to look back at the character of the Military Technical publications which were published in the Kingdom of Serbia and Kingdom of Yugoslavia until World War II. They have their professional profile and quality and have undoubtedly paved the way for today's Military Technical Courier, whose first issue came out in January in 1953, said Lt. Col. Gacesa and added that an important year for the Journal was 2011, when at the discretion of the Ministry of Education and Science, the journal was ranked as one of national importance, in M52 category. - MIlitary Technical Courier will continue to strive to maintain and improve its status. How it will respond to challenges, will be best seen by suggestions and criticism of the scientific community, which will be considered with care and taken into consideration. In this sense, we hope that the next jubilee will be marked with more significant achievements, said the editor of the scientific journal. -The courier has developed from a publication intended for informing and educating internal Army personnel, to promotion of military technologies, to becoming a technical and scientific journal that publishes scientific and technical reports, and information in the field of military technical sciences. The magazine concept included technical systems and equipment, development, production and exploitation of armament and military equipment, integrated systems for surveillance and military as a series of scientific and technical areas relevant to this issue” as general Zrnic stated. He pointed out that thanks to the editorial policy and the response by competent authors, program concept and orientation were constantly perfected, so the Military Technical Journal has grown into a scientific and professional journal that is widely respected, not only in military but also in civil, scientific and educational institutions. 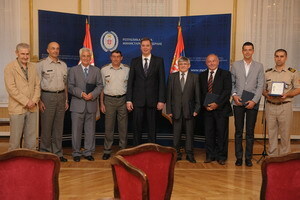 Following the ceremony, General Zrnic presented acknowledgments to prof. dr. Branko Kovacevic, Chancellor of the University of Belgrade, a long-standing member of the editorial committee of the Military Technical Journal, to Dr. Gradimir Milovanovic, corresponding member of the Serbian Academy of Arts and Sciences, Dr. Miroslav Trajanovic head of the Department of Manufacturing Information Technology and Management of Mechanical Engineering, University of Nis and Nikola Stanic, researcher in CEES and deserving individuals who have contributed to the journal’s recognition and reputation. 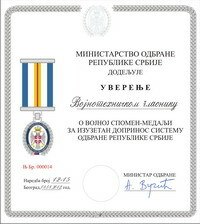 The credit was also given to Ana Kostov, PhD, Scientific Advisor of the Institute of Mining and Metallurgy in Bor and Srećko Stopić, PhD, Scientific Advisor of the RWTH Aachen University, Faculty for Georesources and Materials Engineering, IME Process Metallurgy and Metal Recycling, Aachen, Germany. President of the Centre for Evaluation in Education and Science (CEES) Prof. Dr. Pera Sipka said the editorial in the journal identified a group of enthusiasts. We noticed that editors are quite partial to modernization and innovation. We were impressed by how they responded to the challenges and thereby acquainted us and gave us an insight into their work as Sipka said. 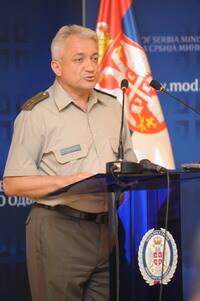 Director of the Media Center "Odbrana" Lieutenant Colonel Slavoljub Markovic, where the publishing of the Journal takes place, has stressed the importance of the magazine, and others in the media and in the scientific world, thanking all the previous editors and contributors for their long-term cooperation. In the lobby of the Central Military Club an exhibition of previous issues of the MIlitary Technical Courier, and other journals it has inherited was set up.